Ministry of Propaganda - 29/Oct/2006: "Sunday Afternoon Walk at the Thames"
After a busy two weeks I decided to take a bit of a break from the job hunt this weekend. Saturday was mainly spent at home, relaxing and watching a few old videos on the web. 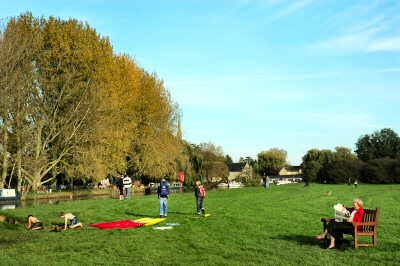 Today I decided to get out for a bit and drove to Lechlade for a walk along the Thames. As I later found out I was now following the 'Seven Stiles Walk'. Walking along the Thames I arrived at the Roundhouse, where the River Coln joins the Thames. Here I crossed the Thames and then walked along various paths (crossing a number of stiles, not sure if there were seven) towards Lechlade. I don't know what it was, on one of the meadows I noticed something interesting: It looked like some kind of spiders web was covering almost the whole field. 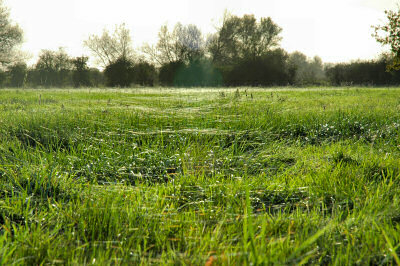 You can just make it out on the picture, the lighter bits in the distance are from light reflected from the 'web'. Any ideas what this could be? In Lechlade I bumped into an old friend (he had worked at Intel as a contractor for a while) and his father. We had a chat about old times, Intel and job hunting (his father is currently looking for a job as well after returning from abroad). By the time I continued my walk it was well past mid afternoon. Through Shelly's Walk I continued towards the Trout Inn, where I briefly considered a pint but then decided against it as it was getting late. 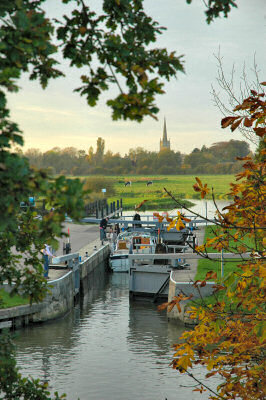 From the bridge over the Thames I had a very nice view over St John's Lock and the Thames towards Lechlade. The walk now passed through three counties in quick succession: Gloucestershire, Oxfordshire and Wiltshire. Along the Thames I returned to the Ha'penny Bridge (the name comes from the bridge toll collected for crossing it) from where it was only a short walk back to the car at the Riverside Park car park. A quite nice walk, not very long, but at least it got me out a bit. A nice break from spending quite a lot of time at my desk the last two weeks. Nevertheless it's back to the job hunt first thing tomorrow morning. I'm sure there a quite a few good and interesting jobs for me out there, it's just a question of finding them. As mentioned on Wednesday, it's not about finding any job, it's about finding the right job with the right company. My goal is to find both by the end of the year, hopefully one of the jobs I'm working on currently is the one.